The 61st Monterey Jazz Festival will help to write a new chapter. More than half of this year’s performances feature women as leaders, co-leaders or side players. Some 60 women jazz artists will be on the grounds, many with their own bands. Most are instrumentalists. The majority play what are traditionally (and inexplicably) viewed as “masculine” instruments: saxophone, trumpet, clarinet, bass, drums. Women have been welcomed at Monterey from the start. The inaugural year, 1958, featured Billie Holiday, Ernestine Anderson and others. Women have been artists-in-residence, commission artists and showcase artists. But this year feels like a turning point, one from which there’s no turning back. 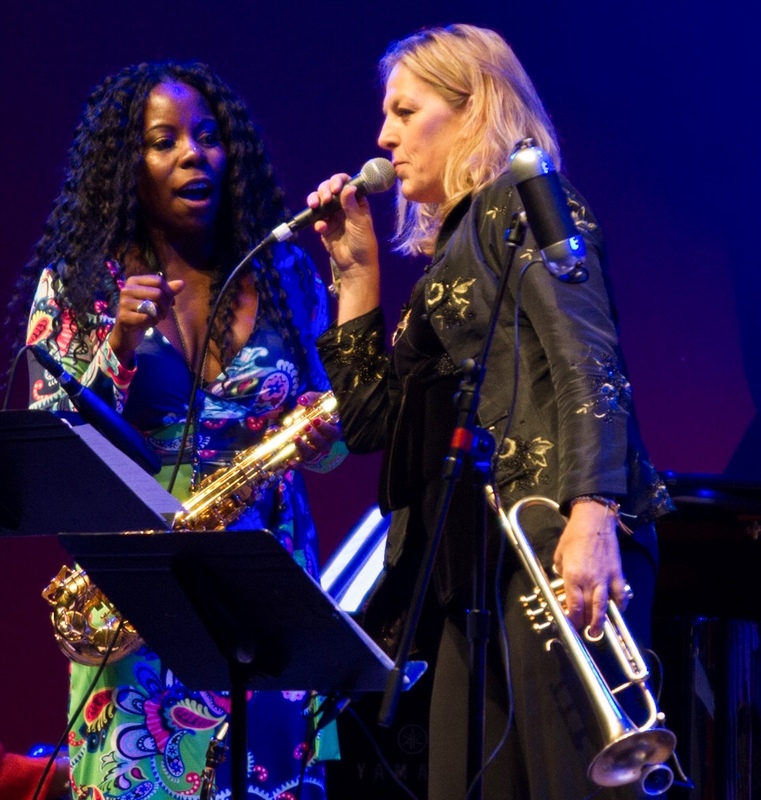 A changing zeitgeist, fueled by the #MeToo movement, has made women jazz artists more outspoken about inequality, underrepresentation, gender discrimination and harassment, and harder to silence and ignore. If 2017 was a “year of reckoning and recognition” for women in jazz, as the New York Timeshas said, then 2018 is a year when we’re seeing some results. Keychange, an international campaign begun in Europe in late 2017, is asking music festivals to achieve gender parity by 2022. New York’s Winter Jazz Festival is among the 100+ festivals around the world to sign the pledge. We Have Voice, a collective of 14 women in jazz and experimental music, has released a Code of Conduct to Promote Safe(r) Workplaces in the Performing Arts. The message: Zero tolerance for harassment of any kind. Seattle’s Earshot Jazz, Chicago’s Hyde Park Jazz Festival and SF Jazz are just a few of the institutions that have adopted the code. Fuller and drummer Terri Lyne Carrington are members of We Have Voice. Fuller and Jensen are this year’s artists-in-residence. Last year, they were part of “Women in Jazz,” a lively panel discussion in the Blue Note tent. (An edited version appeared in DownBeat.) “Women in Jazz Part II” takes place Sunday in the Pacific Jazz Café, a bigger venue. The 2018 Showcase Artist and Jazz Legends Gala honoree is vocalist Dianne Reeves, who was recently named a National Endowment for the Arts Jazz Master. “Monterey was one of the first major festivals she played, early in her career,” Jackson says. That was in 1984. She’s been back several times since. Monterey wanted to honor the late and much-loved pianist and educator Geri Allen, who died in June 2017. Allen was a great friend to the festival, a profoundly influential artist and an inspiration to many women. Jackson put Fuller and Jensen in charge of curating Friday night’s tribute concert in the Arena. They brought in Carrington and pianists Kris Davis and Shaime Royston. Also on this year’s game-changing line-up: stellar clarinetist Anat Cohen, immensely creative soprano saxophonist Jane Ira Bloom, internationally acclaimed saxophonist and flutist Jane Bunnett and her group Maqueque (five young Cuban women), trailblazing jazz guitarist Mary Halvorson, and avant-garde flutist Jamie Baum. By phone and email, our two Artists-in-Residence offered up some thoughts and insights about where we are and what they would like to see happen next. Tia Fuller: There are more opportunities now because people are talking about it. Women are feeling more empowered to speak out. Men are being held more accountable to give more visibility to the women who are out there. More festivals and clubs are providing platforms for us to be seen. Ingrid Jensen: The state is solid. There are more and more women gaining the skills and experience necessary to rise to the top of a very challenging and ever-evolving musical field. TF: We have to raise the level of consciousness in the formative years in school, so these environments are equally as nurturing as they are toward boys and men. So we can see more young ladies out there on the scene who don’t have to wear this armor of protection to go and sit in at a jazz club. IJ: Education! Conversation and support. Band rooms need to have more pictures and CDs of female musicians, as well as the standard Wynton, Dizzy, Miles, and Ella posters. TF: I think it’s about who has traditionally played the instrument. When we think about a saxophone, who do we think about? Trane or Bird. We don’t think about Vi Burnside, who went to high school with Sonny Rollins, played tenor saxophone and was a soloist with the International Sweethearts of Rhythm. IJ: I never got that “masculine” thing when it comes to a hunk of metal. Maybe it’s an American thing? I actually wanted to play the trombone. Both instruments were equally acknowledged as legitimate choices by my Canadian parents and band teacher. Does this mean we have to ask men why they chose flutes and piano? TF: Definitely Terri Lyne Carrington. She started out playing with Clark Terry early on. It wasn’t even an idea for her not to play because she’s a woman. Her mindset is, “If something is in your way, you just move it out of the way.” She will always hold people accountable if they’re not giving her the respect she feels she deserves. She calls them out right there. IJ: My latest role models are Cécile McLorin Salvant, Becca Stevens and Tia Fuller. All stellar humans who inspire me. Early role models: Stacey Rowles, Marianne McPartland, Lil Hardin Armstrong, Melba Liston. Also Laurie Frink. She was the first female trumpet teacher I had, and her incredible teaching launched my career forward. Any advice for young women instrumentalists today? TF: Move in faith, not fear. Move faithfully into your purpose and the direction of your life. Know this is a continuous thing. There’s never an arrival point. Know this is not going to be easy, but it’s going to be worth it. IJ: Study hard! You cannot Instagram your way into this music. It takes a long time to get good at it, so get on the edge of your seat and get going. Don’t take any abuse from anyone. Use the discouragement that naturally occurs along the way as food for power to get even better. Get a good teacher and get out and play as much as possible. ASK QUESTIONS! One great thing about jazz is the pick-up band. Someone’s on the road or comes to town, finds two or three more musicians and plays a night or two. The So-and-So Trio is really so-and-so from New York, Chicago, Detroit or New Orleans plus the bassist or pianist you saw last night at Jazz Central and the drummer or saxophonist who just played the Black Dog, the Dakota, Ice House or Crooners. Another greater thing about jazz is the band that’s been together for a long time. When they’re still together because they want to be – even when life happens, even if everyone individually plays with or leads a bunch of other bands – it’s about more than music. It’s about history, friendship, trust, respect, collaboration and connection. They’ve grown together and learned from each other. You want to be in the room with them and hear what they have to say, to feel that camaraderie and shared creativity. 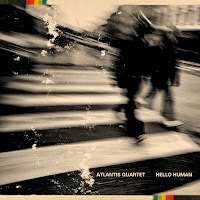 On Friday at Vieux Carré, Atlantis Quartet– Brandon Wozniak on saxophone, Zacc Harris on guitar, Chris Bates on bass and Pete Hennig on drums – will bring their 12 years as a band to the stage as they release their fifth album, “Hello Human.” The title track nods to the fact that all four are now dads, which wasn’t true when the band formed in 2006. Back then the bassist was Travis Schilling, who appeared on their first album, “Again, Too Soon” (2007). Bates had stepped in by 2009, when “Animal Progress” came out. That was followed by the live album “Lines in the Sand” (2011) and “Expansion” (2013). Meanwhile, Atlantis was named Best Twin Cities Jazz Artist by City Pages and the Star Tribune. They performed in The Current studio. In 2015, they won a McKnight Fellowship for Performing Musicians, a $25,000 prize that opened the door to “Hello Human” and four days at Pachyderm Studios in Cannon Falls, where a blizzard was Nature’s way of saying get to work. Along with Bates’ musings on fatherhood (and, by extension, acknowledging each other’s humanity), “Hello Human” includes songs inspired by the connective tissue of the body’s bones and joints (“Ligaments”), a place where five roads converge (“Five Corners”), ancient Chinese medicine (“Meridians”), the music of Ornette Coleman (“Just Ate”), and the stresses and demands of our modern technological world (“Ghost Tensions”). From the earliest days, Atlantis has always had its own distinct ensemble sound, no matter what the musicians were playing. You can listen to “Again Too Soon” and “Hello Human,” two songs 12 years apart, and know you’re hearing the same band. And it doesn’t matter whether they’re playing a fiery, high-energy tune or a tender ballad. Their music can be serious and playful, rowdy and lyrical. It can lead you down a path with a lot of sharp turns. Often complex and unpredictable, it’s never off-putting. The door is always open to those who want to listen. A message from The Bad Plus to our fans and followers: We will soon begin an exciting new chapter in our life as a band. As of January 1, 2018, The Bad Plus will consist of founding members Reid Anderson (bass) and Dave King (drums) and new member Orrin Evans (piano). Original pianist Ethan Iverson will finish out the 2017 touring schedule in support of the album “It’s Hard,” culminating in a New Year’s Eve gig at the Village Vanguard in New York City. The Bad Plus have always been a band in the truest sense — a group of passionate collaborators with no single “leader.” That spirit will continue in full-force as we welcome Orrin into the group. This is not an act of replacement; no tryouts were held. We’ve known and respected Orrin as a musician and as a person for longer than The Bad Plus has existed. His heart and his talents are simply a perfect match to continue our trajectory. A brand-new album featuring the refreshed lineup will be recorded this fall for release in 2018, with a supporting tour cycle to follow. The Bad Plus’ extensive songbook will continue to be represented at shows. We remain grateful to our supporters and invite you along with new listeners to be an integral part of our evolution and the exciting music it’s sure to deliver. The band’s touring schedule for the rest of the year included its usual annual Christmas residency (for 18 years) at the Dakota Jazz Club in Minneapolis, followed by its usual New Year’s residency at the Village Vanguard in New York City. Although the band will continue as The Bad Plus with Orrin Evans at the piano, Ethan Iverson’s leaving signals the end of an era. I wrote about that – and the band’s history, music, and impact on jazz – for the Minneapolis Star Tribune, in an article published on December 14, the Sunday before they came to the Dakota. I spoke with Reid, Ethan and Dave at length, and also with Lowell Pickett, owner of the Dakota, and Philip Bither, performing arts curator for the Walker Art Center, who knows contemporary music, knows the band and featured them several times over the years, mostly recently in a Walker commission with Bill Frisell. Because I could use only brief quotes in the print article, I’m including the full interviews here, edited for clarity, minus chit-chat and off-the-record material. I’ve been listening to The Bad Plus, attending their concerts, buying their albums and following them almost from the start. I saw this as a moment in the life of a great piano trio that deserved a close look. Conducted immediately after they returned from an intense European tour in early December 2017 and just before they came to Minneapolis, these interviews are for the record. Pamela Espeland: According to Lowell, this will be your 18th Christmas at the Dakota. Reid Anderson: Wow. I guess if Lowell says, that’s what it is. PLE: What has it meant to you to play there every Christmas? RA: It’s been very meaningful for us to feel the support of our hometown. That people have come back year after year, and the audience has grown, has been a localized symbol of what we set out to do: to be a band, to create a sound and to have actual fans in the world. It’s all we could really ask for. What will we hear this year at the Dakota? For the last 17 years, we’ve always done a combination of older and newer music. The first year it was all newer music. It’ll be business as usual in that respect. We’ll try to put out a combination of older songs and some of the later stuff as well. Are you approaching this any differently because it’s your final Christmas here as the original configuration? No, we’re not. There’s all this end-of-an-era thing, but that’s not the way we see it. Of course it is [the end of an era], and I understand putting it that way, but for Dave [King] and I, the band is continuing. It’s not like we’re going to make this big, dramatic statement of “this is the end.” It’s not the end. It’s just a change. Is there a secret meaning to the name The Bad Plus? What was your plan when you started out as a trio? Where did you think this would lead? When we started the band, everyone was talking about, “If only we could have a band that was a committed band. We could all get together and develop a sound, and have a cooperative group that can play group music, and develop a language and do what we do.” I think lots of people still talk in those terms. The only way to make this happen is to have that level of commitment. We’ve done it. We’ve had an 18-year run of playing this music together, and we’re very proud of that accomplishment. Your first album was “The Bad Plus”  on the Spanish label Fresh Sound, and then “These Are the Vistas”  for Columbia. That kind of blew things up. The Bad Plus were called the saviors of jazz and the destroyers of jazz. You got a lot of press attention, both positive and negative, including mainstream press. What was that like, and did it give you any second thoughts about what you were doing? It was a surprise to us, as it was for everybody else. But we didn’t come out of nowhere. We were all in our 30s when that album came out. We had all been laboring in obscurity and making our own records and writing music for years before that. By the time we made “These Are the Vistas,” we really knew what we were doing. We had experience under our belts. We had our personal aesthetics pretty much established, and our writing styles were very much there as well. It was an opportunity to record for a major label, and we were ready for it, and we had something unique to say. I guess in a sense it was an idea whose time had come. We were just there. The combination of the kind of stylistic open-mindedness that we brought, and playing the famous cover songs as well – which was not unique to us, but I do think we brought a certain attitude and energy to it that was fresh and, dare I say, it was needed. Something needed to be shaken up. We were just in the right time and place to do that, and we had a sound that was personal. The jazz world isn’t always receptive to a personal sound. They’re much more comfortable with something that they can easily describe and check certain boxes in terms of “this comes from this” and “this is referencing this,” and all that. But we were much harder to do that with. That was disturbing to some people and positive for others. Having said that, I do think that people who were our detractors, a lot of them, if they’ve bothered to stick around, have come around to saying these guys [The Bad Plus] clearly weren’t the end of everything. Jazz has continued on in myriad ways, and we’re another part of that stream. When did you and Dave and Ethan first start playing together? We grew up together. Dave and I have known each other since junior high school. Ethan [Iverson] and I met in 1989 or 1990, when I was a student for one year at the University of Wisconsin—Eau Claire, and Ethan was still a high school student in Menomonie. We were introduced because Ethan needed to make a demo tape for something, and Ron Keezer, who was a percussion teacher at Eau Claire, put us in the same room together. We had mutual interests and hit it off. So we have a long relationship, but The Bad Plus didn’t start until 2000. So we can actually put this on Ron Keezer. Did you start playing together around the same time? I guess around 1990, we got together once in my parents’ living room. That was an unremarkable meeting. We were just young kids all trying to push ourselves and push the boundaries, but without the skills or perspectives to do it very successfully at the time, like a lot of 20-year-olds. But there must have been something there. Ten years went by, and we all had been pursuing our musical paths and playing with each other. Ethan is on two of my records; I’m on three of his from the ’90s. Dave was doing some incredible things with Happy Apple in Minneapolis. I think what sparked it was when Ethan had a concert in Menomonie, and he called Dave to do it, and they hit it off. I remember Ethan coming back from that and saying he had enjoyed playing with Dave. One thing led to another, and we thought – we know each other. Let’s see what happens if we play together. I was a big admirer of Happy Apple. That was kind of the original committed band. So we played at the AQ or something. It just kind of started from there. At that point, when we got together, we felt there was something there. Something we didn’t have to talk about that was there in the music. So we decided – let’s try to play together every couple of months and commit to that and make a record. It just kind of came together naturally. The record was your first, on Fresh Sound. Had you recorded for them before? I had done three records for them under my name, and Ethan had done several under his name. Fresh Sound was an important label for a lot of New York musicians, giving a lot of us a chance to make records that no one else would’ve given us. [Our first record for Fresh Sound as The Bad Plus] got us out there in the world and got us some attention. You can see from that first record that there’s something there. We already had a sound. How many gigs have you played together? Has anybody kept track? It’s a pretty big number at this point. We weren’t doing so many concerts in the earliest days, but probably by 2004 or ’05 it was starting to get up there. Let’s say on average maybe 100 shows a year. That’s just a wild guess. I’m trying to be conservative. That’s a lot of shows, a lot of travel, a lot of road. It’s a lot of music. Yet every time I’ve seen you, I’ve never once felt that you were phoning it in. Good. I think that’s one of the things that’s kept us together. We don’t phone it in, and that’s part of a committed band and the group music ideal that we were going for. It’s like – we’re going to go out and not only have this sound, this tribal language that we speak together, but we’re going to have a collective energy with this music. Part of it is because it’s always our music. Everything we play, every song, no matter who writes the song. We’re all playing our music. That’s a different energy from backing someone up or being the leader. What are you leaving undone as the original trio? Is there anything you would’ve done differently? Honestly, no. We’ve done so much, and there’s no single project or concept we’re leaving on the table. Looking at jazz 18 years ago, and looking at jazz today, what’s different? And what part has The Bad Plus played in that? It’s hard to say from the inside. I suppose we’ve probably influenced the sound of some of the music that’s happening these days. I think bands are really important. I think group music is really important, and I hope we’ve kind of shown the way on that front. We’ve been an example of why you would commit to a band. This is something that can exist within this music, and it should. We heard Brad Mehldau’s trio last night. They’ve been together for a long time. The difference between the Brad Mehldau Trio and The Bad Plus is it’s the Brad Mehldau Trio. They play Brad’s music, and that’s incredible music, but it’s not quite the same as three conceptualists and composers and what The Bad Plus does and represents. Granted, it’s not so easy to get three people to cooperate on that level either, but that’s something we stand behind. We did this. We contributed this. 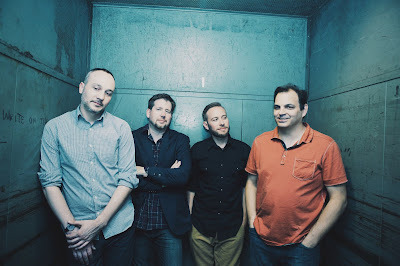 Who do you think is The Bad Plus’s closest imitator? I have no idea. I’ve heard some things where I’ve thought they’ve clearly checked out The Bad Plus, but I’m not trying to uncover or discern who’s trying to emulate The Bad Plus. People are saying GoGo Penguin sounds like The Bad Plus, but to me, they sound more like E.S.T., but then I think E.S.T. sounded like The Bad Plus. E.S.T. was around before The Bad Plus. And E.S.T. stands for Esbjörn Svensson Trio, so that was different. What’s your favorite The Bad Plus album and why? You know I can’t answer that question. I like them all, for their own reasons. I honestly can’t say we’ve ever made a record that I think is a lesser record. When I first contacted you about this interview, I said I would not be writing a breakup article. But I do need to ask about the transition. When did you know that a change was coming and Ethan would be leaving the band? In a sense, I could say it’s been clear for a long time, but Ethan told us in January of this year that he wanted to move on. Was that surprising to you? Can you talk about the decision you and Dave made to stay together as The Bad Plus and keep the name? First of all, Dave came up with the name. It’s very much our band as well. Ethan is one-third of it, but Dave and I have built this thing as well, and we feel very much that it’s ours. It’s not a life sentence to be in The Bad Plus. Ethan wants to move on, and that’s his right, and that’s fine, but in terms of what we’ve done and what we’ve built and what The Bad Plus represents, that’s something that [Dave and I] want to continue. Why is Orrin Evans a good fit for The Bad Plus? I’ve known Orrin since the early ’90s. I’ve played a lot with Orrin and he’s a friend. My stock answer is he’s a fellow weirdo. He’s a brilliant pianist, and he’s also someone who has really committed to a group aesthetic in his various projects over the years. He’s a very inspired player, and he’s the only person we considered. Dave and I said – let’s see if Orrin will do it. We had no one else in mind, and we didn’t have any auditions or anything like that. We just said let’s call Orrin and see if he’s open to doing this. He said yes immediately, which I think was quite brave of him. He wrote “the bad plus Orrin Evans”? See? Written in the stars. You and Dave have already made your first album with Orrin. Yes, and I have to say I really think it sounds very much like The Bad Plus, and that’s the whole point. Orrin is a very different pianist from Ethan, but The Bad Plus is more than just some guys getting together. We’re overall very highly curated, and we’re very concept-based, and we’re very composition-based, and that’s also why Dave and I felt so strongly about continuing, because … how do I say this? What makes The Bad Plus tick is very much in our possession. When we did the record with Wendy Lewis [“For All I Care,” 2009], it sounds like The Bad Plus. When Josh [Redman] comes in [“The Bad Plus Joshua Redman,” 2015], it still sounds like The Bad Plus. There’s a reason that we sound the way we do. It’s not an unconsidered equation. Do you have any final words about The Bad Plus in its original incarnation? No, because it’s not final. I think our body of work speaks for itself, and it’s something we’re all extremely proud of. That’s pretty much what I would say.